Greek Lamb Burger with Lemon Herb Sauce is one of the best burgers that I’ve ever made or eaten. You’ll not want to put it down! John and I love a good burger. There is this place that we go that serves a Greek burger. It is just amazing for the first couple bites. After that, I can taste way too much salt. We decided to recreate our own burger. 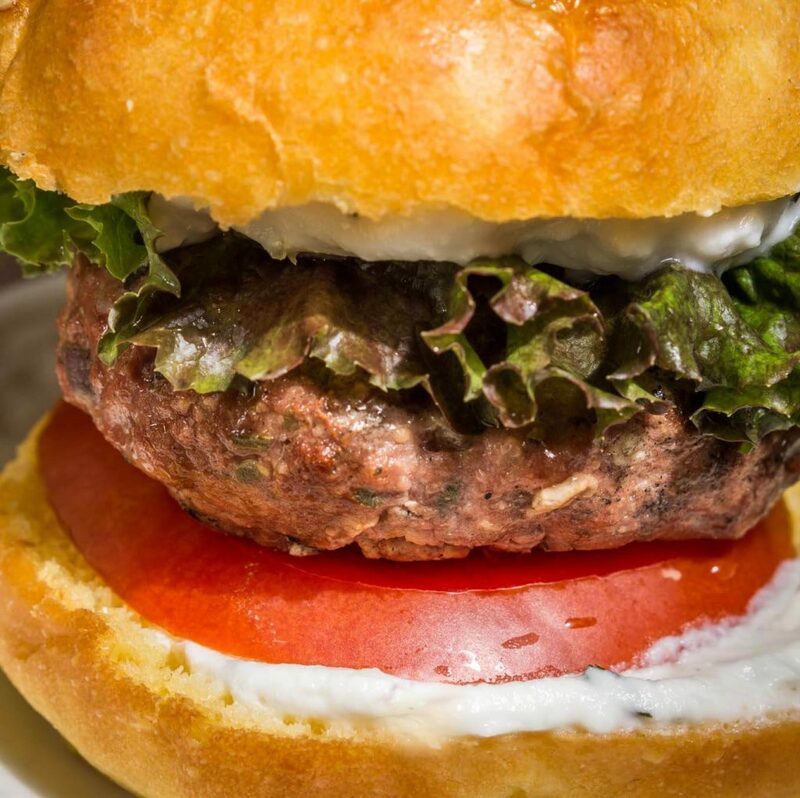 I think our Greek Lamb Burger with Lemon Herb Sauce is even better than the restaurant version. 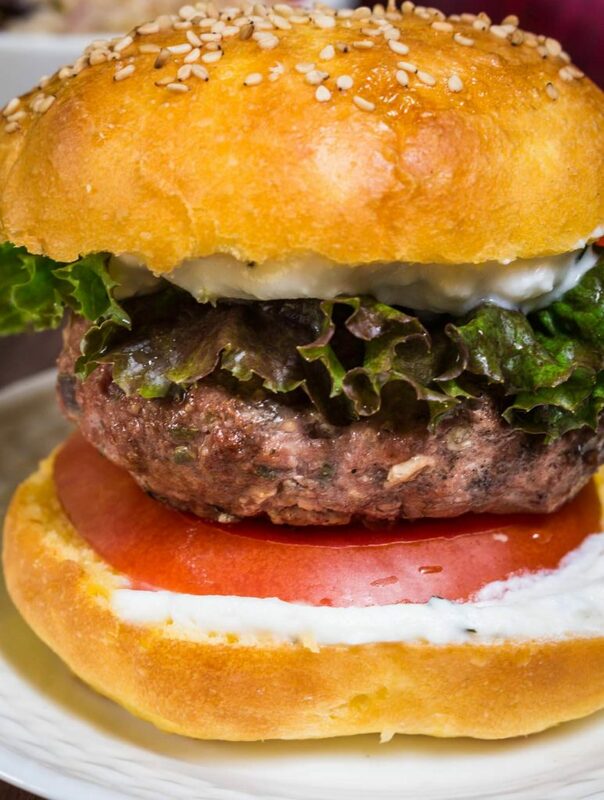 This burger starts with flavorful ground lamb and is then filled with feta cheese, onion, and some wonderful herbs. The lemon herb sauce is just delicious and best of all, it isn’t calorie or fat-laden. This burger was fancy enough to serve with a glass of wine (or two) and that is exactly what we did. We loved this burger so much that we decided it was perfect for company. Our guests loved it just as much as we do. Do you remember my Tabouli Salad Recipe? I told you that I was on a Greek kick lately. I actually served that salad with this burger. It was a combination made in culinary heaven. And, did you recognize the bun? Yep, it’s my buttery Brioche Bun recipe. It just took this burger to a whole new level! 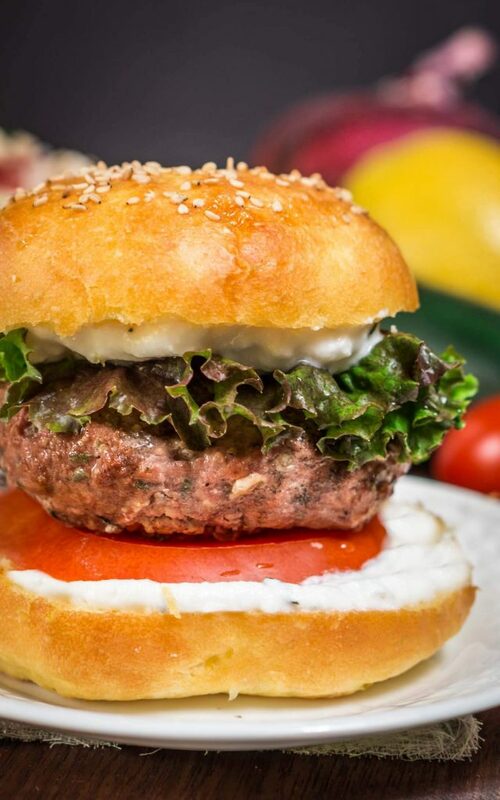 Greek Lamb Burger with Lemon Herb Sauce is one of the best burgers that I've ever made or eaten. You'll not want to put it down! Combine Lemon Herb Sauce ingredients together and refrigerate until serving. Combine all burger ingredients and divide into 4 patties. Grill until a probe thermometer registers 150°F. Set aside to briefly rest. 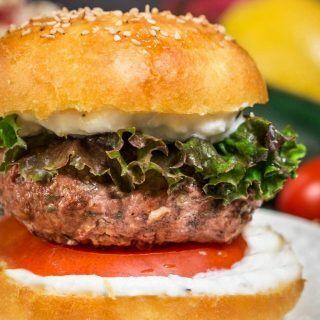 Assemble by spreading the Lemon Herb sauce on the inside of the top and bottom bun. Add tomato, lettuce, and additional onion if desired. 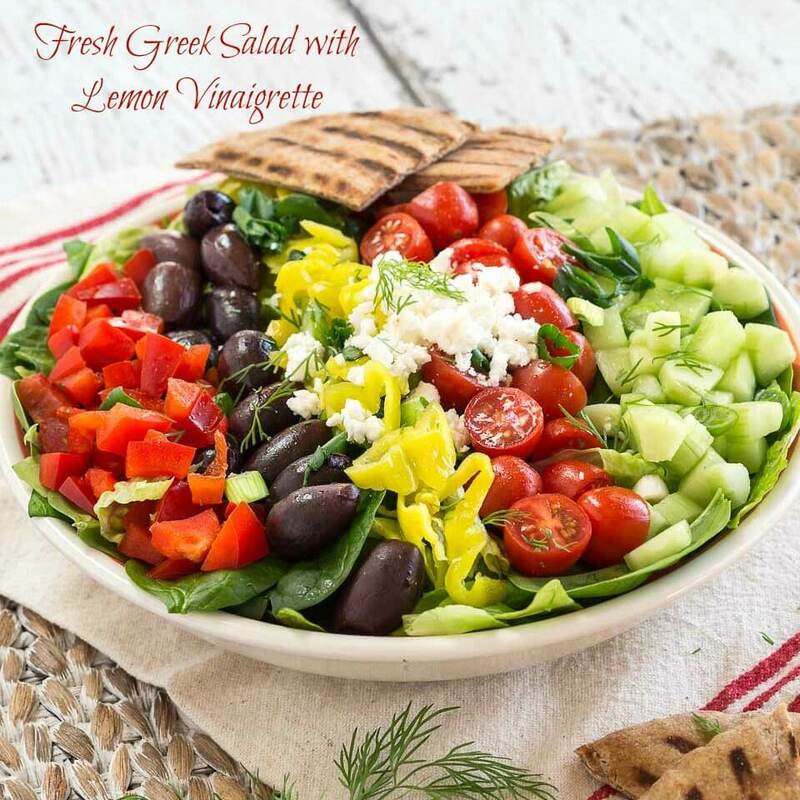 If you’re still looking for great Greek recipes, here are a few that I love! 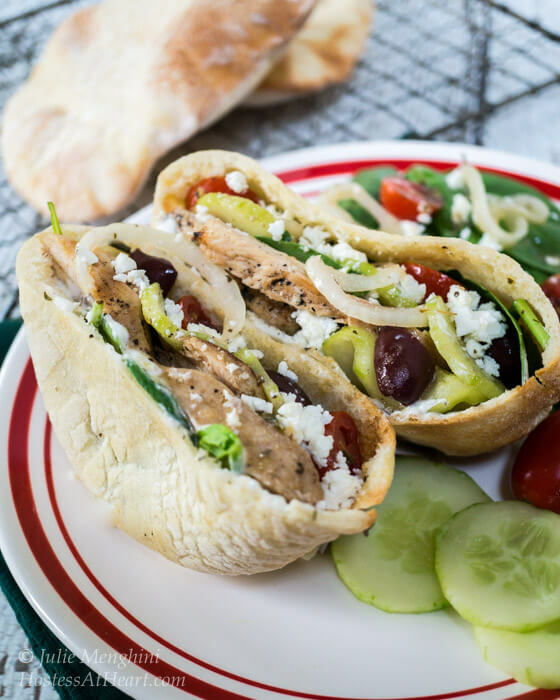 If you are feeling creative, you can serve this burger in an Easy to Make Pita bread! What is your favorite burger? I’m always looking for burger ideas and would love to hear yours in the comments below! Making your own is Let’s keep in touch! You can find me on Pinterest, Instagram, Facebook, Twitter, and YouTube! Better yet, enter your email address in the box below and never miss a recipe! Oh, YUM!! Where’s the hubster? He needs to clean our grill, stat! I need to make this! Thank you Angie! The hubster will love them! Happy FF! Thank you Ana! Please let me know what you think. I loved it! my husband and I love a good burger too and this one sounds delicious great! 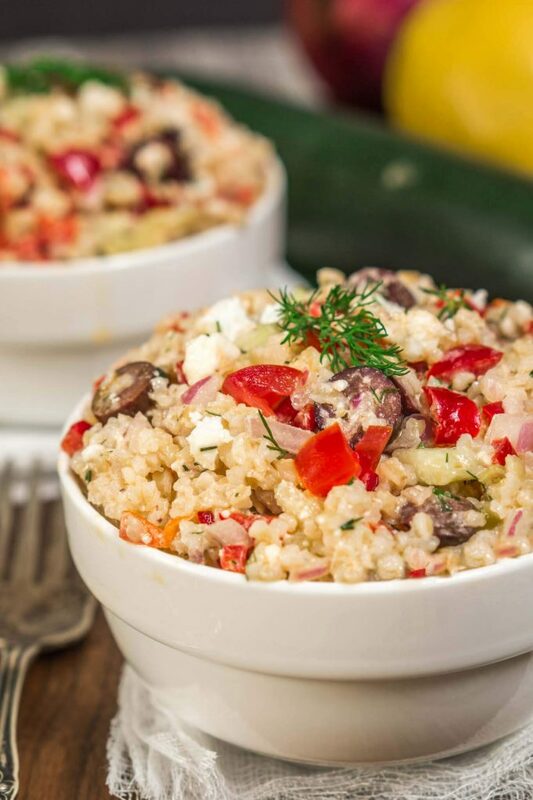 I love Greek flavor and spices, so this recipe is on my to-do list. Pinned! We’re big lamb fans and that sauce sounds delicious – I think we need to give these a try! Thank you Caroline! I never used to be but I’m a convert. You are an amazing cook, Julie! This is an incredible meal you put together with everything from scratch. I really like the additions to the meat, especially the feta, and the lemon sauce for the burger. My husband and I both love hamburgers, too, and would go crazy over this one! Your homemade buns just put it over the top! Thank you so much Shari! I think you are an amazing cook and very creative too! Thank you Linda! Fiesta Friday is the best and I wouldn’t miss it! Thank you for co-hosting Linda! Now this is a great sounding burger and great pics. Burgers are not very photogenic. Thanks for sharing with us at Throwback Thursday. Pinned and shared! Can’t wait to see what you bring to the party this week. Thank you Quinn! Burgers are hard to photo. I still struggle when I’m running around my food trying to see what other do. Cookies are coming to TT this week! What a delicious-looking burger–absolutely mouthwatering! 🙂 The Lemon Herb Sauce sounds wonderful, too! Thank you Nancy!! I hope you have a wonderful week. Thank you Sarah! We are becoming such burger snobs LOL. I appreciate your sharing! Omg this looks so delicious I’m salivating! I love lamb but I’ve never had a lamb burger. It’s unfortunately not really a thing in Japan. Neither is ground lamb. Maybe I could grind lamb myself with knives and give this a go! Happy Fiesta Friday! Thank you Ai! You’re so darned sweet and I love it when you stop by. John and I make another burger where we grind our own meat so you could give it a try. Make sure that you don’t trim it to lean. You will want some of the fat so it will form into a patty. Enjoy your day my friend! I am not a huge fan of lamb, but I have to admit that looking at your pictures I am drooling! The lemon herb sauce must bring the burger and additional amazing flavour! Thanks a lot for being at FF this week! Thank you Margherita. I thought the same thing not long ago but am becoming a fan. Thank you so much for hosting this week! I love the feta in there, too, but that sauce is calling my name! Lamb always seems so special and this burgers are gorgeous! i really wish i had a burger to devour right now! this look so so good. and i love the mouthwatering photos. Thank you Thalia! I just love the name of your blog. Butter and Brioche and my life is complete! Thanks for stopping by and I hope you have an amazing weekend! I really need to make lamb more often. You’ve inspired me! Can’t wait to give this a try. Thank you Sarah! I hope you’ll let me know what you think. We loved them. Julie those burgers look amazing, putting feta in the burgers is a great idea. Love the flavors like a gyro. Yum….. Thank you Suzanne! They are so good! Thank you so much Linda! I can’t lie, it’s the best burger I’ve ever eaten and am making them again this weekend. Thank you Linda! I hope you love them as much as I do.